Visual Learning Bridge teaches math concepts step-by-step with purposeful, sequential illustrations while connecting learning activities and lesson exercises. Grade 3 hardbound edition expands visual learning with focus questions and pictures with a purpose, and students learn to express concepts in writing. 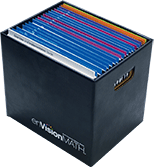 Everything you need to teach and plan in one handy file box. Organized into focused topics, 20 Teacher’s Editions are followed by corresponding Topic Teacher Resource Masters Pouches. 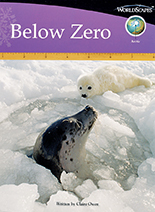 Durable Teacher’s Editions are used for the length of one topic. Sturdy Topic Teacher Resource Masters Pouches contain easy to copy blackline masters. Package also includes the Teacher Program Overview which provides program overview, topic planners, pacing guide, scope and sequence, and more. The Teacher Program Overview provides program overview, topic planners, pacing guide, scope and sequence, and more. The Problem of the Day Teacher's Guide for enVisionMATH provides you with detailed teaching support for each Problem of the Day. It allows you to incorporate in-depth teaching of rich problem solving into your daily instruction. Reinforce lessons with duplicates of Practice Masters in a workbook format. Students get extra practice in a format that is easy to take home. Assess students' ability and track progress using this time-saving system for assessment, diagnosis, intervention, and monitoring. Organized by strand, tied to lesson concepts, and addressing a range of grade levels, it is ideal for use in summer school, after-school programs, or regular classes. Each part of this system contains a Teacher's Guide and tests. Five to seven readers plus Guided Problem Solving Masters for each grade teach math concepts and real-world applications through literature. WorldScapes math content readers for Grades 3–6 promotes real-world problem solving while teaching students about different countries and cultures. Use these center activities to differentiate instruction while intervening with struggling students. Each kit contains: 5 copies of the Ready-Made Center book and 5 Center Manipulatives Kit. Materials to provide hands-on learning opportunities during center activities. A wide assortment of manipulatives for a classroom to support lesson activities comes in a sturdy plastic bin for easy access and storage. 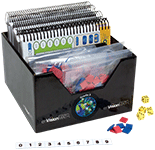 Overhead manipulatives kit includes a handy storage bin that attaches to your overhead projector. 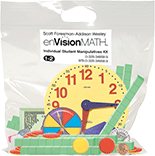 Individual, easy-to-manage assortment of manipulatives organized for each student to enhance mathematics instruction. Use in conjunction with Student Edition with Premium Digital System purchase. Includes ExamView® Assessment Suite Test Generator CD-ROM, MindPoint® QuizShow CD-ROM, and eTools Electronic Math Manipulatives CD-ROM; plus it backs up your online resources with the Student Edition CD‑ROM, Teacher’s Edition CD-ROM, and Digital Path Content DVD‑ROM. Digital Path Content DVD-ROM also includes Table of Contents, Visual Learning Animations, Quizzes with Leveled Homework, Video Topic Openers, Printables, Guided Practice with embedded Tools4Math, Topic Games, Print Partners and Keys, Computation Games, Tools4Math Workshops, and Enrichment Activities. Also includes Premium Digital System Teacher Online Access Pack and Premium Digital Implementation Guide. All CD-ROMs are also available separately. Use in conjunction with Student Edition with Digital System purchase. Includes Digital System Teacher Online Access Pack, Student Edition CD-ROM, Teacher Edition CD-ROM, Visual Learning Animations CD-ROM, Bilingual ExamView CD-ROM, MindPoint QuizShow CD-ROM, Topic Games CD-ROM, and eTools CD-ROM. All CD‑ROMs are available separately. Use in conjunction with Student Edition with Digital System and Digital System Teacher’s Resource Package purchases. This license allows a building administrator to access reports and test scores for all grade levels using the Digital System Teacher’s Resource Package. Games make math fun. 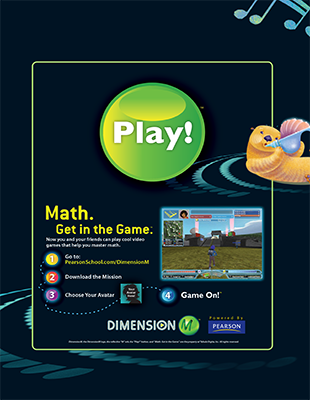 Reinforce math content in an interactive game format. Windows: Minimum Processor: Pentium II 233MHz; Minimum System: Windows 2000 (SP 4)/XP (SP2); Memory: 256MB; CD/DVD Speed: 8X; Hard Drive Space: 40MB (20MB for Lite version). Windows: Minimum Processor: Pentium II 233MHz; Minimum System: Windows 2000 (SP4)/XP (SP2); Memory: 128/256MB recommended; CD/DVD Speed: 8X; Hard Drive Space: 100MB. Macintosh: Minimum Processor: G4 400MHz; Minimum System: OS 10.3.9; Memory: 128MB/256 recommended; CD/DVD Speed: 8X; Hard Drive Space: 100MB. Windows: Minimum Processor: Pentium II 233MHz; Minimum System: Windows 2000 (SP4)/XP (SP2); Memory: 256MB; CD/DVD Speed: 8X; Hard Drive Space: 40MB (20MB for Lite version). Macintosh: Minimum Processor: Power Mac 200MHz; Minimum System: OS 10.3.9 (Classic mode required. Will not work on Intel based Macs. ); Memory: 256; CD/DVD Speed: 8X; Hard Drive Space: 32MB (20MB for Lite version). Windows: Minimum Processor: P4; Minimum System: Windows 2000; Memory: 256MB; CD/DVD Speed: 4X; Hard Drive Space: 30MB. Macintosh: Minimum Processor: G3; Minimum System: OS 10.3.1 (Classic mode required. Will not work on Intel based Macs); Memory: 128MB; CD/DVD Speed: 4X; Hard Drive Space: 30MB. Windows: Minimum Processor: P4 750MHz; Minimum System: Windows 2000 (SP4)/XP (SP2); Memory: 256MB; CD/DVD Speed: 8X; Hard Drive Space: (N/A). Macintosh: Minimum Processor: G4 1GHz; Minimum System: OS 10.4; Memory: 512MB; CD/DVD Speed: 8X; Hard Drive Space: (N/A). Contains the entire contents of the Teacher’s Edition so that you can plan lessons from anywhere. Easy navigation with PDF files accessible from point of use of all print resources from the Topic Teacher Resource Masters Pouches. Also available online. Windows: Minimum Processor: Pentium II 233MHz; Minimum System: Windows 2000 (SP 4)/XP (SP 2); Memory: 128/256MB recommended; CD/DVD Speed: 8X; Hard Drive Space: 1000MB. Macintosh: Minimum Processor: G4 400MHz; Minimum System: OS 10.3.9; Memory: 128/256MB recommended; CD/DVD Speed: 8X; Hard Drive Space: 100MB. Windows: Minimum Processor: Pentium II 120MHz; Minimum System: Windows 98 (Higher versions also supported. Color display capable of 256 colors or better also required. ); Memory: 256MB; CD/DVD Speed: 600kbps; Hard Drive Space: (N/A). Macintosh: Minimum Processor: Power PC 120MHz; Minimum System: OS 10.2; Memory: 128/256MB recommended; CD/DVD Speed: 4X; Hard Drive Space: 32MB. Incorporates research-based best practices to show your staff how to interpret student achievement test scores, assess staff development needs, and implement a professional development program. Research-based math background for every math strand focuses on the Big Ideas as they articulate across the grades. 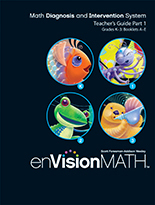 This enVisionMATH professional development DVD contains Modules and Conversations with enVisionMATH authors about key mathematics concepts in Grades 3-6. In the Modules, authors use visuals and manipulatives to show how to develop these concepts with students. In the Conversations, authors discuss how to build conceptual understanding of these concepts in the classroom. Non-consumable book containing all of the student lessons for transitioning to Common Core featured in the Transitioning to Common Core teacher resource kit available to all enVisionMATH users on SuccessNet.